The United States Navy maintains a number of its ships as part of a reserve fleet, often called the "Mothball Fleet". While the details of the maintenance activity have changed several times, the basics are constant: keep the ships afloat and sufficiently working as to be reactivated quickly in an emergency. In some cases (for instance, at the outset of the Korean War), many ships were successfully reactivated at a considerable savings in time and money. The usual fate of ships in the reserve fleet, though, is to become too old and obsolete to be of any use, at which point they are sold for scrapping or are scuttled in weapons tests. In rare cases, the general public may intercede for ships from the reserve fleet that are about to be scrapped – usually asking for the Navy to donate them for use as museums, memorials, or artificial reefs. In November 1976, the controlling organization was the Inactive Ship Division of the Naval Ship Systems Command. As of 2011, the controlling organization actually appears to be the Inactive Ships Management Office of the Program Executive Officer - Ships, Naval Sea Systems Command, Portsmouth, Virginia. Merchant ships held in reserve are managed as part of the separate National Defense Reserve Fleet within MARAD (US Maritime Administration). 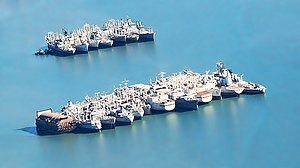 Several of its sites, such as at Suisun Bay in California, are also used to store regular Navy ships. Ships placed in the reserve fleets are categorized depending on priority, funding and the planned disposition. Category B Ships in this category are prioritized over the other categories when it comes to maintenance and funding. They are retained for possible future mobilization and will receive updates and upgrades as funding permits. Category C These are ships that will be maintained as-is; meaning no updates or improvements unless funding becomes available after that assigned for category B ships has been exhausted. Category D Temporary state pending planned usage by the Navy, will be maintained as-is. Category X Ships stricken from the Naval Vessel Register awaiting disposal. Receives no maintenance except ships on donation hold which undergoes dehumidification and cathodic protection. Category Z This category is for nuclear-powered ships and related support ships pending disposal. Around 1912, the Atlantic Reserve Fleet and the Pacific Reserve Fleet were established as reserve units, still operating ships, but on a greatly reduced schedule. After the Second World War, with hundreds of ships no longer needed by a peacetime navy, each fleet consisted of a number of groups corresponding to storage sites, each adjacent to a shipyard for easier reactivation. For example, USS Brock (APD-93) was underway for Green Cove Springs, Florida, on 11 April 1945. Brock arrived there on 13 April 1945, and joined the Florida Group, 16th Fleet, which later became the Florida Group, Atlantic Reserve Fleet. Many of the deactivated Second World War merchant vessels were of a class called the Liberty Ship which was a mass-produced ocean-going transport which was used primarily in the convoys going to/from the U.S., Europe and Russia. These Liberty Ships were also used as the navy's support vessel for its fleet of warships and to ferry forces across the Pacific and Atlantic. It was a race between how fast the U.S. could build these ships and how fast the German U-Boats could sink them, and the Liberty Ship was significant in maintaining the beleaguered United Kingdom. Most of these Liberty Ships when deactivated were put into "mothball fleets" strategically located around the coasts of the U.S. They began to be deactivated and scrapped in the early 1970s. Vice Admiral Thomas C. Kinkaid served as Commander, Sixteenth Fleet, after World War II. Sixteenth Fleet later became the Atlantic reserve fleet. The groups of the Atlantic Reserve Fleet were at Boston, Charleston, Green Cove Springs, Florida, New London, MOTBY/New York Harbor, Norfolk, Philadelphia, and Texas. The 19th Fleet became the Pacific Reserve Fleet. The groups of the Pacific Reserve Fleet were at Alameda, Bremerton, Columbia River, Long Beach, Mare Island, San Diego, San Francisco, Stockton, Tacoma and Olympia, Washington. USS Iowa (BB-61) laid up in Suisun Bay (Iowa has since moved to the Port of Los Angeles as a museum ship). A similar fleet, the National Defense Reserve Fleet, is anchored in Suisun Bay near Benicia, California, and has similarly been reduced. This location is known for hosting the Glomar Explorer after its recovery of portions of a Soviet submarine during the Cold War before its subsequent reactivation as a minerals exploration ship. The Beaumont Reserve Fleet, anchored in the Neches River near Beaumont, Texas, contains the amphibious assault ship USS Nassau (LHA-4), a number of transport ships, plus a dozen minesweepers. A Naval Inactive Ship Maintenance Facility (NISMF) is a facility owned by the U.S. Navy as a holding facility for decommissioned naval vessels, pending determination of their final fate. All ships in these facilities are inactive, but some are still on the Naval Vessel Register, while others have been struck from that Register. The Naval Inactive Ship Maintenance Facility holds several dozen inactive warships, including the aircraft carrier USS John F. Kennedy, Ticonderoga class cruisers, Oliver Hazard Perry class frigates, and numerous supply ships. The Naval Inactive Ship Maintenance Facility at Puget Sound Naval Shipyard, located next to Bremerton, Washington, hosts, among its other ships, the aircraft carrier Kitty Hawk. two dozen decommissioned submarines, several frigates, and numerous supply ships, It is the former home of the nuclear cruiser USS Long Beach which was scrapped. The Naval Inactive Ship Maintenance Facility at Pearl Harbor, Hawaii, holds logistic support ships and amphibious transport dock ships. ^ General Accounting Office, , 8. ^ "GENERAL POLICY FOR THE INACTIVATION, RETIREMENT, AND DISPOSITION OF U.S. NAVAL VESSELS" (PDF). DEPARTMENT OF THE NAVY. 6 February 2009. Chapter 3. Retrieved 5 October 2014. ^ "Cape Ann (AK-5009)". Retrieved 12 February 2011. ^ "Cape Avinoff (AK-5013)". Retrieved 12 February 2011. ^ "Cape Juby (AK-5077)". Retrieved 12 February 2011. ^ "Cape Nome (AK-1014)". Retrieved 12 February 2011. ^ "Puget Sound Naval Shipyard". www.historylink.org. This page was last edited on 3 January 2019, at 15:11 (UTC).